This week financial market participants were delivered a cogent explanation for the weakness in EM stocks, bonds and currencies by India’s central bank governor, Mr. Urjit Patel. In Mr. Patel’s opinion, the US Federal Reserve’s tightening of monetary policy (most specifically balance sheet shrinkage, or the allowance by the Fed to let maturing bonds roll off their balance sheet without reinvesting the proceeds) combined with more than necessary US Treasury issuance of bonds is to blame for a dollar shortage that is ripping through emerging markets. He points to the widening of US dollar denominated emerging market sovereign bond spreads – the difference between EM debt yields and the 10-year US Treasury yield – as a symptom of the double whammy of policy tightening. This assertion certainly makes intuitive sense. The Fed’s policy of allowing its balance sheet to shrink necessarily causes other players to enter the market to buy up new issuance of bonds. At the same time, the US Treasury issuing more debt that it needs exacerbates the issue (i.e. 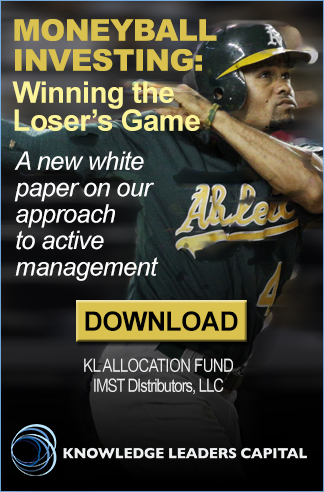 it pulls liquidity from the market in order to meet the supply of bonds). 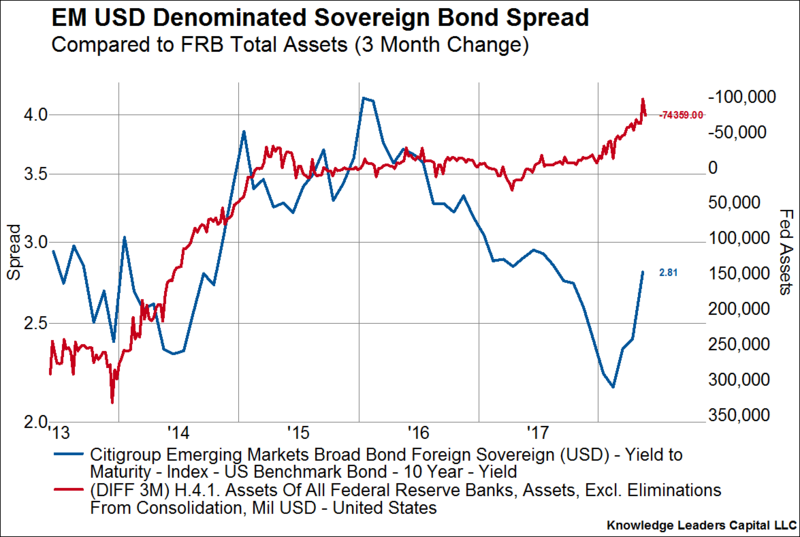 This recent experience simply highlights the fact that the Fed is no longer the marginal buyer of government and/or mortgage bonds, and so the US dollar liquidity needed to facilitate debt issuance in the US is being sourced at the expense of EM bonds. But, there may be more than meets the eye when it comes to the underlying roots of EM market struggles. We can actually test the hypothesis that Fed balance sheet runoff or excess Treasury issuance of securities is to blame for EM market volatility. For example, in the first chart below we plot the EM US dollar denominated sovereign bond spreads to the US 10-year Treasury yield (blue line, left axis) and then overlay the three month difference in Fed assets (red line, right axis, inverted). It’s hard to deny a tenuous relationship, but it leaves a lot of explaining to do. In the second chart we plot the US term premium (blue line, left axis) – the excess yield investors require to hold longer dated Treasury bonds – and then overlay EM sovereign spreads (red line, right axis). If the Fed growing its balance sheet resulted in an unnatural compression of the term premium, then the Fed shrinking its balance sheet should cause the term premium to normalize and widen out. 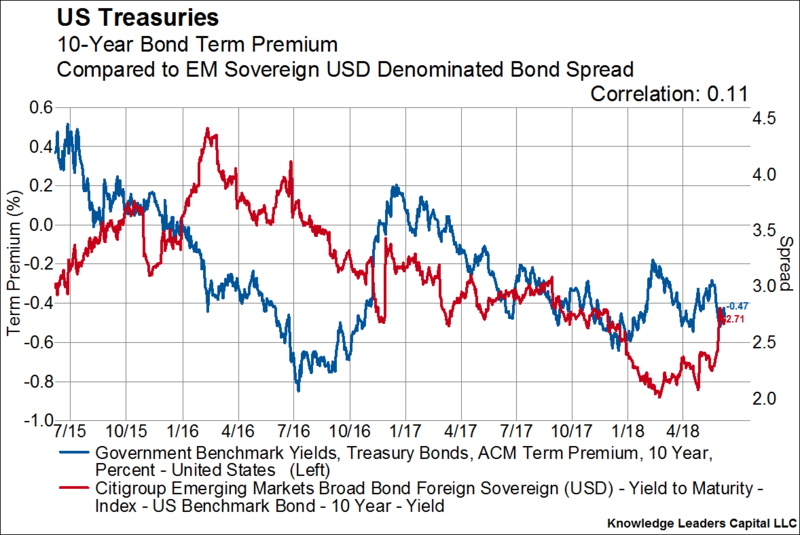 Therefore, if there is a relationship between Fed’s balance sheet and EM sovereign spreads, there should be a relationship between the US term premium and EM sovereign spreads. As the chart below shows, if there is a relationship it is again only a tenuous one. Next, we test how likely it is that Treasury issuance is causing EM sovereign spreads to widen out. It’s no secrete that the Treasury needs to issue more debt to fund larger fiscal deficits in the US, and so that fact should conceivably be priced into the market. 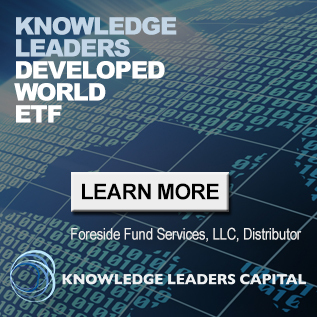 What is harder for participants to price is any excess treasury issuance above and beyond what is needed to meet fiscal obligations, so that is what we analyze in the third chart. 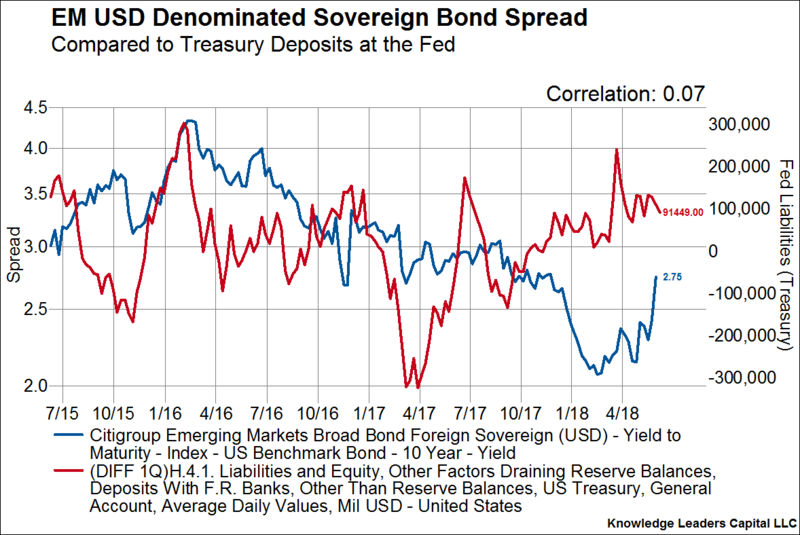 The blue line plotted on the left axis is our EM sovereign spread indicator and the red line plotted on the right axis is the one quarter difference in Treasury cash held at the Fed, which is a proxy for excess Treasury issuance. Here, again, there appears to be an on-again-off-again relationship that may help explain some, but certainly not all of the stress in EMs. So if US policy is not wholly responsible for EM stress, what else could explain it? How about oil prices? 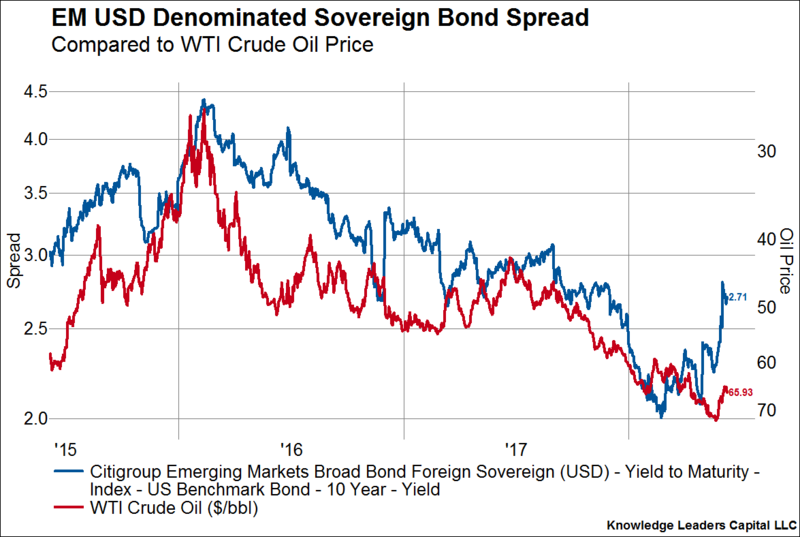 It happens to be the case that many EM economies are dependent on oil sales as a large source of either government or corporate revenue, and it turns out that EM sovereign spreads are highly correlated with the price of oil, WTI crude in particular. The recent selloff in oil (red line on right, inverted axis) has been coincident with the bulk of spread widening (blue line, left axis) in the EM debt markets. 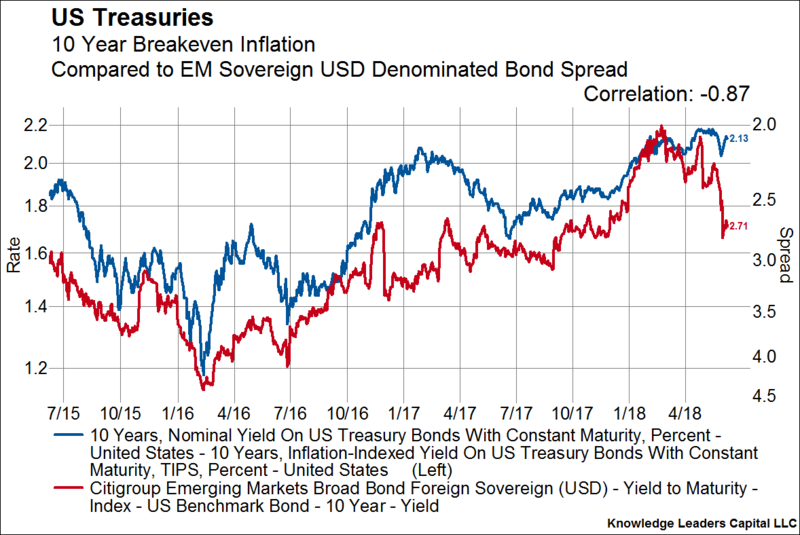 As EM spreads are correlated nicely with oil prices, they are also nicely correlated inflation expectations priced into the bond market. Here we plot breakeven inflation expectations with the blue line on the left axis and our EM spread indicator with the red line on the right, inverted axis. As inflation expectations rise, EM spreads tighten. The halting of inflation expectations, and then the most recent dip, appears to be happening at the same time EM spreads have widened. What could cause inflation expectations to break above their recent ceiling, thereby helping to push back down EM spreads? Here are three possibilities: higher oil prices, a weaker US dollar and/or stronger underlying inflation. We wrote recently about the selloff in oil being buyable and will soon release a piece helping to explain why the recent strength in the US dollar may not be permanent. Below is our last chart which shows the path forward for inflation over the coming quarters. 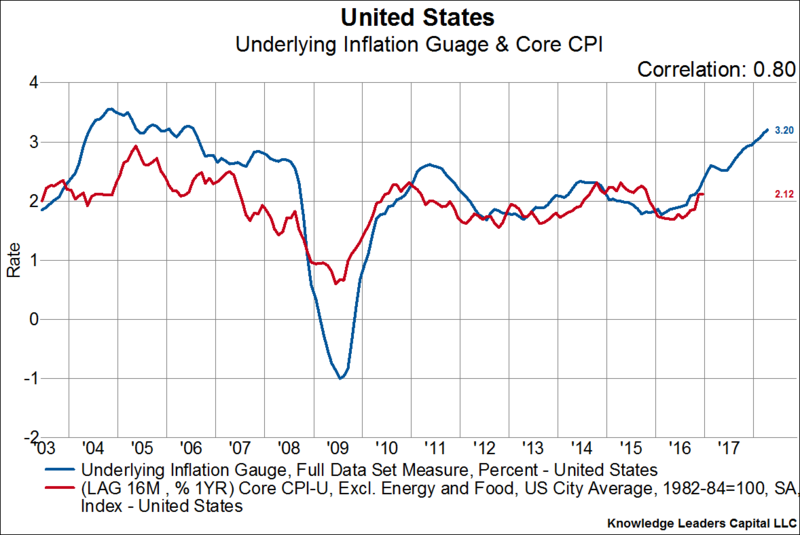 We compare the Fed’s Underlying Inflation Gauge (basically a measure of trend inflation) to the core CPI. The Fed’s measure of trend inflation is currently at the highest level since 2005 and it leads core CPI by about 16 months. With breakeven inflation expectations tracking the level of core CPI, we should expect higher inflation readings to manifest in higher inflation expectations priced into the bond market, which could put a ceiling on EM spreads.